O’Connell of the Pop Bakery teaches you all you need to know, from how to create the cake balls—a mouthwatering mixture of chocolate cake and frosting—to dipping the cake balls in the special candy coating. Then she explains her unique method of painting the POPs using cocoa butter. Choose from 25 scrumptious recipes, from cute panda POPs to a family of Russian dolls. Clare also introduces you to her special layer cakes, which are embellished with classic flower cake POPs. With clear, step-by-step photography and Clare’s easy-to-follow instructions, cake POPs are incredibly fun and easy to bake and make. Both children and adults will adore these bitesize delights that are perfect for parties and special occasions. So what are you waiting for? Start cake POPping now! • Cake POPs are billed as the new cupcake. • The Pop Bakery has been a huge success in London in only a short time, and Clare’s cake POPs are regularly used for promotional events by various companies including Topshop and Calvin Klein, as well as by Vogue during London Fashion Week. • Clare O’Connell has been featured on the UK’s DailyCandy website. Clare O’Connell runs her business, Pop Bakery, from her family home in West Hampstead, London, and supplies to numerous corporate clients, from Samsung to Air New Zealand. Clare has also gained a number of clients from the fashion industry, including Calvin Klein, Charlotte Olympia, Swarovski, and Olivia Rubin, and she regularly works with Topshop designing cake POPs for promotional events across the UK. 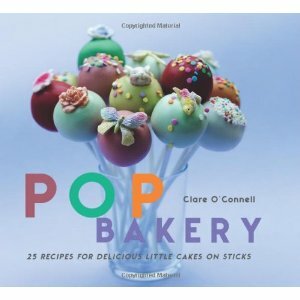 Clare is the author of Pop Bakery; this is her second book. Visit her website at www.popbakery.co.uk. The author is based in London, UK.